This entry was posted on Tuesday, April 20th, 2010 at 8:36 pm	and is filed under New work, Rings. You can follow any responses to this entry through the RSS 2.0 feed. You can leave a response, or trackback from your own site. I’m stumped! How does the pearl stay in place?! Hiya! 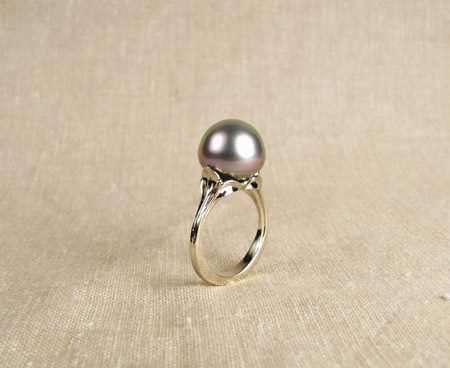 I drill the pearl half-way, then I make a notched post for the ring mounting. The pearl is then impaled on the post and held in place using a certain type of epoxy (i.e., #330). It’s pretty strong.. I’ve had to remove one before and it took HOURS (there is a pearl-friendly solvent that can be used to soften the epoxy) and my fingers were sore for days from pulling and pulling. 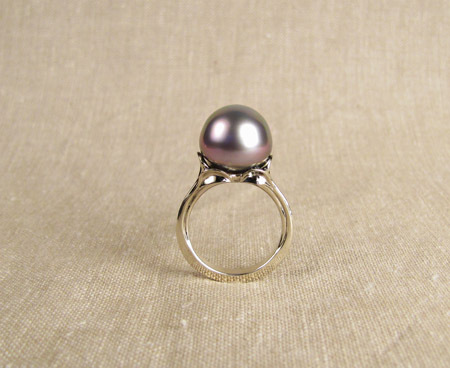 One can technically hold a pearl in place with carved “prongs” (carved flower petals, say) but it would cover up a lot of the pearl since it would have to go more than halfway up the pearl to get a hold of it securely. 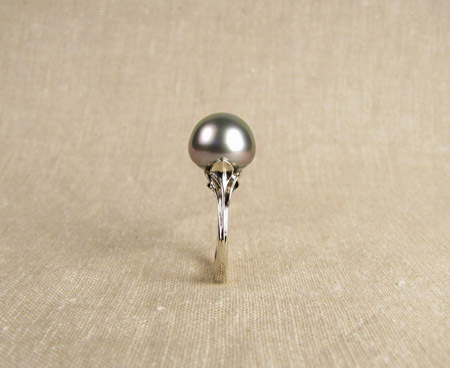 In so mounting, you would risk scratching the pearl with either the metal prongs or your tools, and then if it was not very securely set, any jiggling of the pearl would create wear spots and ruin it.